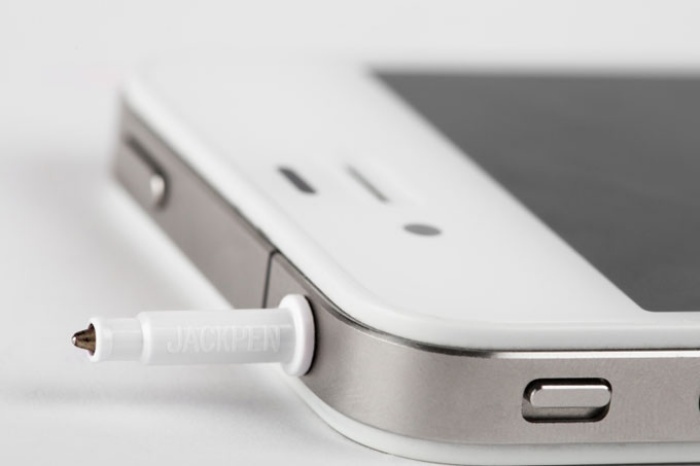 Jackpen is a Mini Pen That Fits Into Your Phone's Headphone Jack | OhGizmo! There’s more that can be done with your phone’s headphone jack than meets the eye. First and foremost, it’s where you’re supposed to plug in your earphones or headset so you can make and take calls hands-free and listen to some music. It’s also where people put phone jack charms and accessories in order to bling up their devices. And then there’s the Jackpen. It’s a miniature pen that fits into your smartphone’s headphone jack, transforming your device into a pen of sorts. When you’re done using it, just flip the pen around so that the non-writing side is what’s facing the outside. A pack of three Jackpens costs £3.99 or about $7. cool, love the idea.. how about the ink? haha..
k. so what is the point of this? Does it translate what you are writing into a memo feature on the phone? It looks like its just a mini pen that does nothing more than write. Seems pretty senseless. What happens when you are signing a check and your phone vibrates?